Comments Off on Don’t Judge? To judge is to form an opinion, or to form an estimate or evaluation. 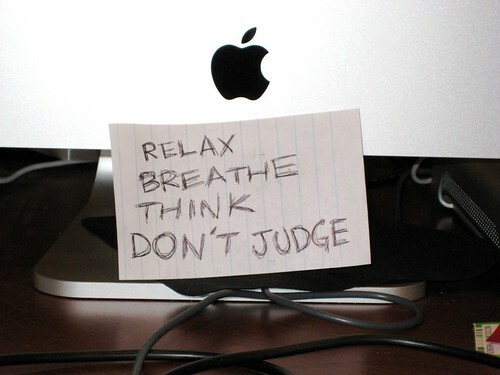 When I hear “don’t judge” in the way it seems to be most often used -particularly social media- I think about how impossible it seems. We judge things all the time. We all instinctively form opinions about everything from food to cars to people. We can’t avoid having opinions. I think the intent of the “Don’t Judge” maelstrom is mostly well-intended. I think a better word for what people are trying to say would be “Don’t Condemn”. It seems that nobody reacts negatively when I judge someone to be pretty or smart or competent. It is when I move from judging to expressing contempt for others that I have crossed a line. My opinion about the relative appearance of a person is powerless in and of itself. When I state that a person is ugly in appearance, I am revealing my perception about that person. I am not stating a fact. Another person could find the same person attractive. Neither the positive nor the negative opinion a) alters the actual appearance of the person in question, or b) measures the worth of the person in question. What is more, asking me not to state my opinion or to change my opinion is to devalue me. It means that my thoughts and feelings don’t matter or shouldn’t exist if they disagree with yours or make you uncomfortable. I don’t have to call you handsome if I think you look like a troll, nor does the fact that I think you look like a troll make you in fact, a troll. It does not even mean that you are actually, objectively, “ugly”. I am not bullying or being contemptuous when I state my opinion. My opinion becomes contempt when I attempt to declare the worth of a person or thing. If I look at the person I deem unattractive and proceed to tell them, “Your mother should have aborted you,” I am expressing contempt. When I say “You should wear a bag over your head so the ‘rest of us’ don’t have to look at you,” I am expressing contempt. I am declaring what you are worth (an objective reality) on the basis of my subjective perception. I express contempt for your being, which I have assessed on the basis of your appearance exclusively. We are devastated by opinions because we equate them (and often they are expressed) as measures of our worth. We are devastated because we somehow have come to believe that our worth is actually connected to what the other person is saying. The vast futility of contempt is that it absolutely cannot do what it is trying to do: change the actual innate value of the thing (or person). PreviousWhat if I don’t feel grateful?